Thanks a Million! DD Perks Reaches 1,000,000 Members! 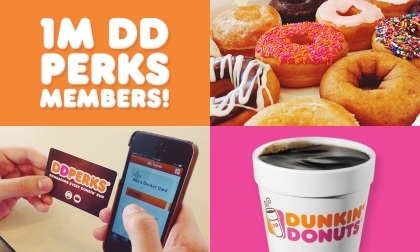 Less than 5 months ago, we announced the launch of DD Perks®, a program designed to reward our guests with points toward free Dunkin’ Donuts beverages for every qualifying purchase made at participating locations. We started this program as a way to repay our fans for their dedication, which is why we’re so thrilled to announce that we’ve surpassed one million members in just a few months! This is such an important milestone for our brand so we’re paying it forward to our loyal guests by automatically depositing 100 bonus points directly into the accounts of all existing DD Perks members. We’re even going one step further by offering 100 bonus points to new DD Perks members who enroll between June 4 and June 10. To get these points, users have to insert the special promo code: MILLION. For details on enrolling and the benefits of DD Perks, visit www.DDPerks.com. Our loyal guests are the backbone of our brand which is why we created a program like DD Perks to thank our guests for their ongoing business and incentivize them with product offers customized to their preferences. To learn about the number of different offers you could receive through DD Perks, check out this past blog post. We have set a goal to reach 2.5 million members by the end of 2014, and this milestone is one giant step toward our goal. We will continue to looks for innovative ways to enhance our relationship with our guests and build loyalty through our DD Perks program. Have you joined our DD Perks program yet? Share your experience with us on Facebook and Twitter!